1.5L 4-Cyl. 130 hp 114 lb-ft.
Advanced airbags, Honda LaneWatch, vehicle stability assist with traction control, ABS. Spacious/flexible interior, leather trim, heated seats. Air conditioning, Honda Magic Seats, Bluetooth, HandsFreeLink, 4-speaker audio. Small, agile and affordable are just a few of the many words that can be used to describe the 2016 Honda Fit in Dayton OH. The Fit is one of the spunkiest hatchbacks to put rubber to concrete. 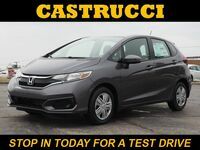 With plenty of interior volume for passengers and cargo, an efficient engine and many features for both comfort and safety, the Honda vehicle offers everything drivers could want and need. The Fit also comes with something that most other vehicles don’t, the Honda Magic Seats. Features like the Honda Magic Seats make it easy for drivers to manipulate the seats for better use of overall space. The seats have three settings for various types of cargo and mixtures of passengers and items. The Fit also comes with other standard features like the rearview camera, which make driving safer as well as easier. For a small vehicle, it is a highly capable vehicle.with much to offer. The Fit offers a 1.5-liter 4-cylinder engine that produces 130 horsepower and 114 pound-feet of torque. Plenty of power for the agile, little vehicle. It also offers an EPA rated 33 city and 41 highway mpg*. The interior offers a surprising 95.7 cubic feet of passenger volume and 16.6 cubic feet of cargo space. With the seats down the cargo capacity increases to 52.7 cubic feet. It is also quite small on the outside and offers easy parking and driving. Along with the spacious interior and powerful engine, the Honda Fit also offers quite a few safety features. These include quite a few active safety features, which are designed to keep drivers in control and on the road. Vehicle stability assist, ABS, brake assist, tire pressure monitoring and more, work together to achieve this goal and create convenience for drivers. 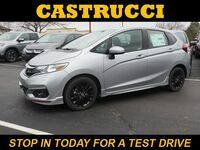 For more information on the 2016 Honda Fit you can view our available inventory online or even schedule a test drive with us.